It's already been two weeks since everything happened, and while I've done my best to keep everyone updated through our Facebook Page and Instagram, I thought it would be best to go over the sequence of events and further details (that I can recall) of what happened to Evanna on July 1 aka Canada Day. This past Thursday I went and finally Goggled "Septic Shock", and I'm even more amazed and in awe that Evanna is still alive. 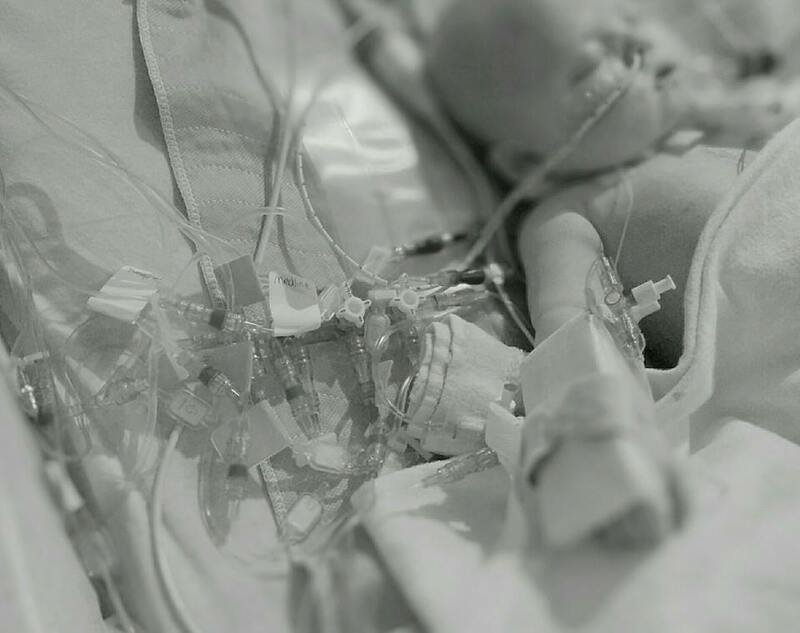 For a healthy infant, the mortality rate for Septic Shock is astronomically high, and then you take Evanna's heart and lungs into consideration and she should not be alive right now. When I last blogged, we were getting ready for our transfer back to Calgary. Evanna was doing fantastic and it was time to go back to Calgary and work towards getting out of the ICU and onto the floor. The transfer went incredibly well and I even got to go with her. Nick came up the day before by bus and was able to drive my car back down to Calgary and meet us at the hospital. Unfortunately Evanna began to slowly deteriorate, and when we look at everything in hindsight, she actually was showing signs even before we left Edmonton. A few days prior to transfer Evanna's vomiting had increased, and at one point during trach care I noticed an odd bump at the top of Evanna's sternotomy. I pointed it out to Dr. Cave (our primary intentivist), but it also happened to be right under Evanna's trach and so we thought it was just a pressure sore. We covered it up to add an barrier between the trach and her scar and left it alone. On Tuesday (June 30), we decided to take the bandage off and look at it, and we discovered a bit of a mess. The pressure sore had opened up and was bleeding. Once they cleaned it up, there was a perfect little hole at the top of her sternotomy, and while it looked fairly "innocent", it was actually quite deep. Dr. Blackwood was able to put an entire head of a q-tip into it, and so they consulted plastic surgery. They took a swab of it, and I don't remember when we found of the results (pre or post Septic Shock), but I know it came back positive for a Staph infection. 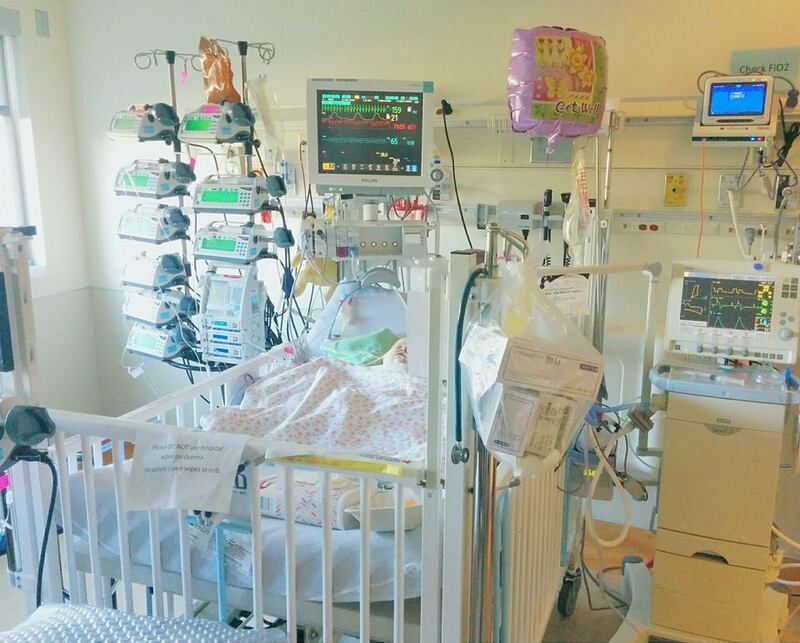 During all this Evanna was having a harder time breathing and her CO2 levels rose, so they decided to switch her back to the hospital ventilator as a precaution. They started to wonder if she had an infection just above her heart or if there was an unknown foreign body causing problems and we started to really worry. They emailed Dr. Rebeyka and the word "Edmonton" was brought up. "It's been a long day. Though the distance between Edmonton and Calgary is relatively close, ICU transfers are still complicated and a lot of work! While Evanna is still doing great, she is extremely tired -- but trying oh so hard to fight sleep! She is having a hard time keeping feeds down due to do much air getting into her stomach (hopefully the medical team can figure out a solution), and a blister that I discovered 2 days ago under her trach that's at the top of her her sternotomy scar has popped and created a pressure ulcer. It was caught very early, so they'll definitely have Plastic Surgery come assess it first thing in the morning so it doesn't get any worse. Pictures of summer fun are starting to pop up on my newsfeed and my heart is aching a little bit tonight. While our transfer back to Calgary was a BIG step forward, I feel like there is always "something" that comes up to add to our long list of Evanna's complications. Nick actually has quite a few days off at the moment (it's coincidentally his regular vacation time), so I will finally have an opportunity to do some stuff for myself over the next week, as I've had to push multiple things off with Evanna's health taking precedence. Tonight I come asking that though Evanna is "alright", please keep her in your thoughts and prayers. We have come so far, and I just want things to go somewhat smoothly from here on out. Pray that her small, but still trivial issues resolve and that our journey home is a clear one. --->> Evanna is technically 14 Months old today! It's amazing how time moves both really slow in the hospital, it also moves fast." "PICU Day 268 || I feel like Evanna can never catch a break. Just a few days ago, our "problem list" was slowly starting to shrink and I could envision home, but now it feels like a mile long given the last 24 hours. I rarely get a phone call from the hospital, but last night around 2am we got one. So what's going on? Well, Evanna has a few infections brewing again, and it's from multiple places. First is from a urine culture that they did in Edmonton before we left came back positive. Secondly, and MUCH more concerning is that ulcer/hole at the top of her sternotomy scar and under her trach. Last night the intentivist put a q-tip in it, and it went quite deep. They're worried about it infecting the conduit in her heart which would be just devastating (seriously I can't convey how bad it would be if Evanna's conduit in her heart got infected). They're consulting radiology to see if they should do an ultrasound or CT to check exactly how deep that "hole" is, and we're praying it's not close to her conduit. Last night Evanna continued to vomit a lot, so they turned off feeds completely. They've restarted them at an very low volume on a continuous rate this afternoon, and we're hoping to do a few small increased throughout the day as tolerated, and hopefully Evanna can keep everything down. Finally, Evanna is on incredibly high ventilator settings, so much so, that they brought up that if they go any higher, they may have to flip her back over to the hospital vent. They're not rushing into anything, but we will definitely be consulting with Pulmonology today to get their opinion. He CO2 levels are pretty high right now, so between that and her "hole", Nick and I are pretty stressed at the moment. ✖✖PRAYERS PLEASE✖✖ Thank you." 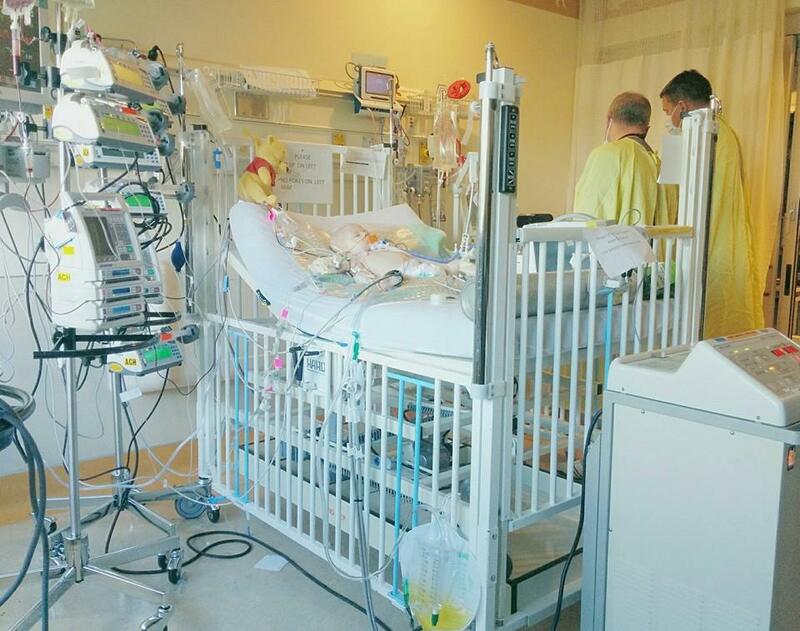 "Day 268 Update || So after climbing to a heart rate of 200, increased "work of breathing" and higher CO2 levels, they decided to put Evanna back on the hospital ventilator. This is not her failing the home vent, but a tool to help Evanna combat this nasty infection and give her more support. Within minutes of switching her over, her heart rate and CO2 came down and she has finally fallen asleep. We've had multiple disciplines in and out of our room all day, and an email has been sent to Dr. Rebeyka (our cardiac surgeon). Evanna is on two antibiotics, and the ultrasound did reveal a pocket of fluid above her chest bone (they can't tell if it's a abscess or ulcer). They've decided to proceed with a CT to get a clearer picture, so feeds have been stopped and we're preparing to take her down to the lab later tonight. The word "Edmonton" has been said, as hypothetically if there is a foreign body (like part of a suture) is floating around in there, she would have to go back to the Stollery to have it taken out. We're not jumping to conclusions, but all possibilities are being explained to Nick and I. To say we're having a rough day would be a understatement." By that evening things had calmed down and we decided to leave to go grocery shopping. On Wednesday morning (July 1st) we got another phone call while we were finishing getting ready to come to the hospital as soon as possible. I felt like it was Mother's Day all over again (when Evanna ended up being transferred back to Edmonton via STARS for the second time), and I AGAIN underestimated how bad the situation was. We walked into the unit and they had just finished doing an ECHO on Evanna. The cardiologist (Dr. Meyers) had done the exam herself, and once they were finished, Dr. Mahoney and Dr. Meyers asked if they could talk to Nick and I in the conference room. They began to tell us that basically Evanna's body was shutting down and they didn't know if Evanna was going to make it. They needed to know how far Nick and I were willing to go in regards to saving Evanna, and laid out exactly what that entailed. They said due to her anatomy (Evanna does NOT have a right SVC, which means they can't cannulate her onto ECMO here in Calgary, and even in Edmonton, they would have a really hard time getting her successfully onto the circuit). 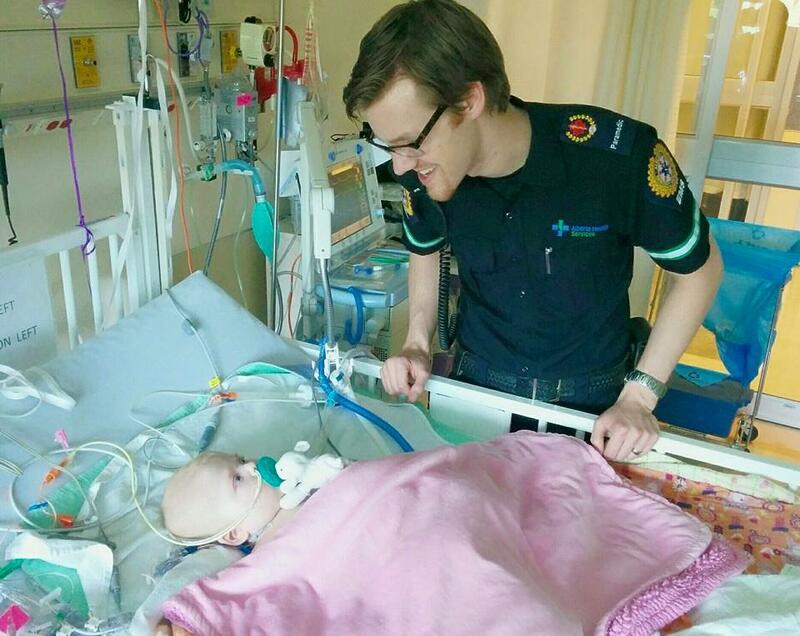 They said that at the rate things were going, Evanna may not even survive a transfer back to Edmonton, be stable enough in Edmonton and to get her on ECMO. Dr. Meyers began to talk about all the risks and consequences of ECMO, and the extremely high risk for a brain bleed or stroke. Finally they said that due to the nature of why Evanna would possibly need ECMO, they're was a very small chance that she would ever even come off of it successfully. Nick and I of course are in tears at this point, and they said to even begin to think of the possibly of preparing ourselves to say goodbye to her. They said that we had some time to talk and think about it, and that the current time they were working on getting more access to start some additional drug infusions and blood products. This was our worst nightmare. We had come so far, but I guess it just wasn't enough. Dr. Mahoney decided to insert an IJ (central line) to open our options up, but she didn't want to go in blindly. She ordered an emergency ultrasound of her neck, and by some miracle, BOTH of her jugular veins were open. During all of this, they weren't able to get a peripheral IV into Evanna, so they decided to do an IO (intraosseous), which means they drilled a line into Evanna's bone so they could give her some plasma. These are INCREDIBLY painful, and despite how much sedation medication she was on, Evana was still twitching in pain as our nurse was pushing plasma. During all of this we began to call our close family and told them to make their way to the hospital in case the situation continued to worsen, and we also called our Bishop and asked if he would come too (we gave her a blessing once things settled done that afternoon). 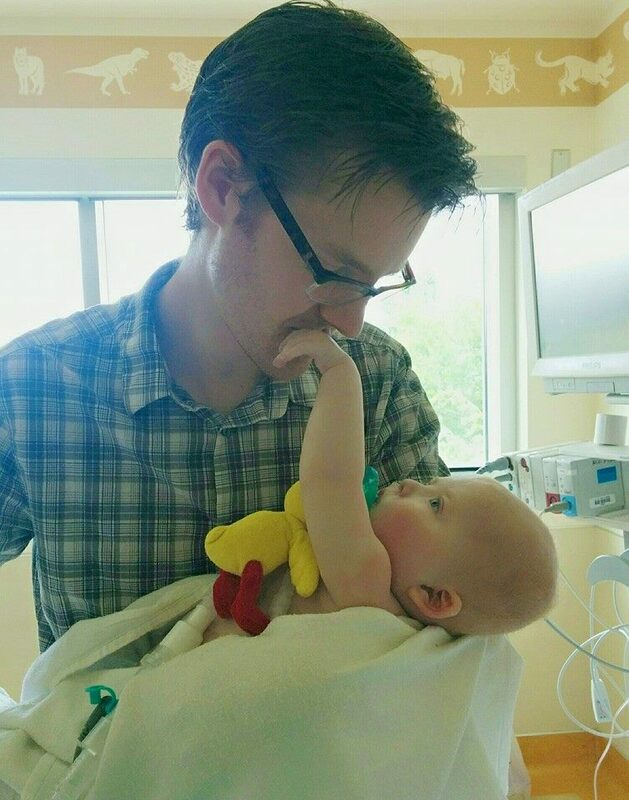 After they confirmed that both of her veins were both open, Dr. Mahoney came over and with tears in her eyes and said that in regards to Edmonton, while it was still a possible option, we needed to realize that Evanna would probably die on the way there with her, instead of here in our arms. We stated that we just wanted to take it one step at a time, and she said that was fair. Dr. Mahoney asked that we leave so they had a sterile environment to work in for the IJ placement, and we give Evanna a kiss. 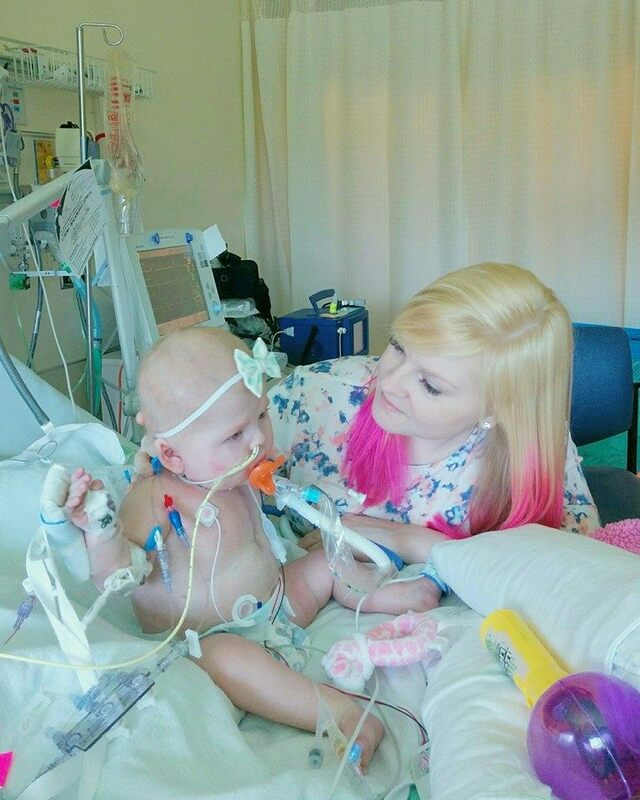 Just before we left, Evanna was waking up again, and she began to lift her arm and try to put a soother in her mouth. Evanna really loves her soother, and it was kind of a sign that despite everything that was going on, she just wanted the one thing that brings her the most comfort. Nick and I walked out into the waiting room where all of our family was waiting, and many prayers began to be said. About an hour later Dr. Mahoney walked out and said that surprisingly (she's a hard poke!) everything went very smoothly and she was able to get the line in on her first try (last time, it took Calgary over 3 hours to place a central line). She asked that we give them a little bit more time to get some things in order and that our nurse would come out when they were ready for us. "Mini Update: So a few hours ago they were telling us to prepare ourselves to lose Evanna, HOWEVER things have slightly improved. We are not out of the woods, and the situation is still very critical. As a short term solution, they ended up inserting an IO, which is basically an IV drilled and inserted into her bone. It's incredibly painful, and Evanna was noticeably in a lot of pain when they pushed drugs/product through it. It was necessary to buy them time until they were able to secure other avenues of access. Her INR was over 3, which means that her blood was very thin and she was at risk to bleed out (and that her liver function is not good). They administered some plasma to help reverse that issue and a quick ultrasound showed that both of her jugular (neck) veins were open. Thankfully they were able to insert an IJ line without any issues, and this opens up a few more options for Evanna. 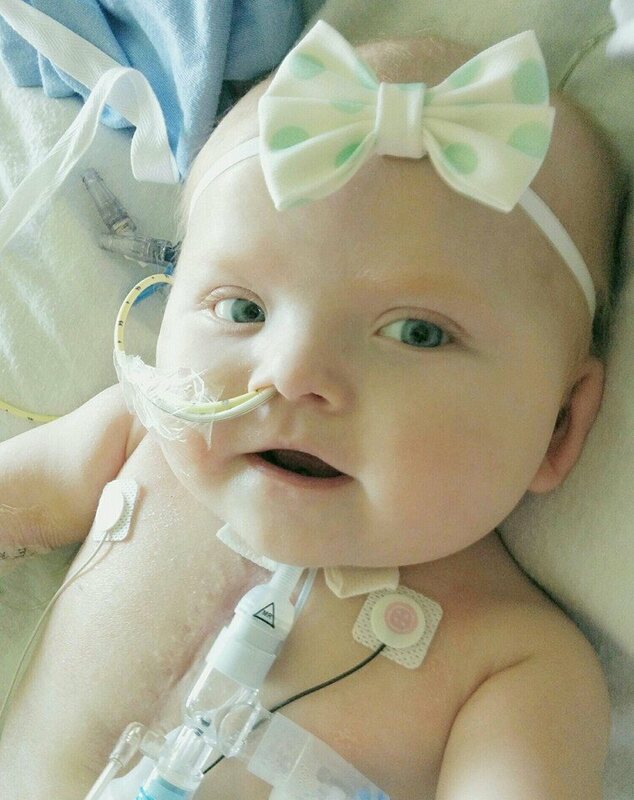 Her poor little heart and organs have been through so much, and we have to pray that she'll continue to stay strong enough to battle this awful infection." "I kind of don't know what to say after today's events. We are definitely in shock and processing everything that occurred over the past 12 hours. When Nick and I came to the hospital this morning, we were taken into a conference room and asked to think about what possible steps we were willing to take to possibly save Evanna. While we want to do everything that we can, due to Evanna's unique anatomy, some options aren't exactly black and white (like ECMO), and due to how critical she was at the time, the intentivist bluntly asked if we wanted her to possibly die during transfer to Edmonton for the very small chance that they may be able to put her on ECMO (and even ever come off of it), or here in Calgary - comfortable and in our arms. Things were THAT bad, and we couldn't believe it had come to this after everything she's been through. We then turned to you for prayers, and boy - did you guys deliver! My social media accounts have been flooded with love, prayers and support, and I can't thank you all enough for the quick response. Family rushed to the hospital, and when our Bishop arrived, he, Nick and my dad gave Evanna a priesthood blessing. Much to ours and the medical teams amazement, Evanna somewhat improved. Normally it takes hours for the Calgary team to place IJ and arterial lines, but the intentivist was quite shocked at how quickly and smoothly she was able to get lines in Evanna. 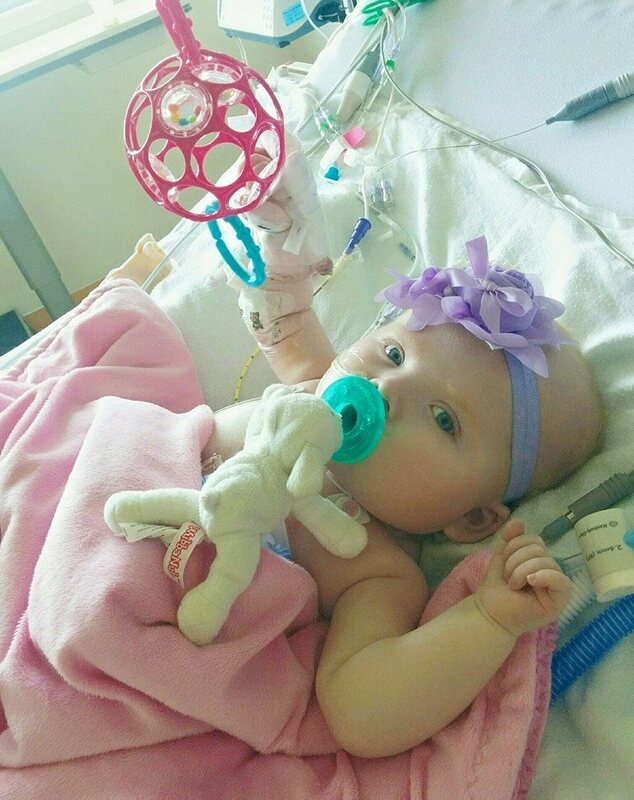 With more access, they've been able to give her a transfusion, antibiotics and medications to help Evanna, and her blood gases began to show improvements. She actually got stable enough that they were able to take her for that CT around 5pm so we can pin point the source of infection and figure out our next step. It's been a long exhausting day, and due to how many nurses were required to help our nurse, they actually assigned two nurses to Evanna tonight. Please keep those prayers coming. We've seen them work first hand today, but this is only the beginning. Prayers for continued strength for Evanna's body, and prayers for continued guidance for our medical team to make the right decisions." "I know it's late, but the PICU operates 24hrs/day. Though the CT was done earlier today, it was by no means easy to read and decipher. Unfortunately the area of infection is in an area of major scar tissue from all of Evanna's previous open heart surgeries. They had MULTIPLE radiologists look at it here in Calgary, and even one of the best pediatric radiologists in Edmonton took a look herself, as she was thankfully working tonight (this is the same radiologist that made Evanna's last CT into 3D back in May). They've determined while the area around her sternum is indeed inflamed, it's not infected and that our current plan of antibiotic treatment is the best course of action. This means that we don't need to go back to Edmonton as a surgery isn't necessary (the cardiac surgeon on call tonight in Edmonton also agreed with this decision) and that we can STAY in Calgary. At the moment, Evanna's kidneys and liver are of current concern as they took a major hit today and her lab work is reflecting that. We JUST got the latest results back, and while her kidney has shown some improvement, her liver is still getting worse. This same thing happened back in March, so they're just going to continue to monitor it and consultant the "liver doctors" tomorrow morning. The intentivist has told us to leave and get some sleep and promised to call us if anything changes. Thank you for your continued prayers, love and good thoughts." Overall it was a very long day. I know at the end, Dr. Mahoney (we actually recently asked if she would be our primary intentivist) walked in and was so happy that she was so wrong about how the day was going to go. She stated that she couldn't express enough at what they saw on the monitor when they did an ECHO (ultrasound of the heart), and the cardiologist couldn't believe that Evanna is still here (she may have joked that Evanna has like 18 lives). We stayed late as were were waiting to hear back from the radiologist and surgeon on call up in Edmonton on whether the infection was by Evanna's sternum bone/heart, because if it was, they needed to transfer her as soon as possible back to Edmonton (so of course I was mentally preparing ourselves for a middle of the night transfer). Finally around midnight, Dr. Blackwood came in and confirmed that the infection was not near her sternum bone nor her heart, and now that Evanna was stable, for us to go home and get some sleep. So what saved Evanna? Well Nick clarified on our drive home that if it weren't for the epinephrine, Evanna would definitely not be here. I believe it was a combination of our excellent medical team, the MANY antibiotics, inotropes (drugs that help the heart pump), blood product transfusions (please go donate! ), and we definitely can't ignore the many prayers that were said on our family's behalf is what got us to here today. We truly saw a miracle take place, and while at one point I was making funeral arrangements in my head (it's not that we gave up hope, but with what the doctors were telling us, it was a natural thought process), we thankfully get to continue towards taking Evanna home. So since that day, Evanna has slowly but steadily improved (with some little bumps along the way). While many interventions had to be done to save Evanna, unfortunately there have been some small repercussions that we've had to work through. For the days immediately following, Evanna's liver once again became a cause for concern, and her body overall had to recover from this event. "PICU Day 270 || Considering everything that happened yesterday, Evanna had a very good night last night. It's a day of tests, more consults and essentially just picking up the pieces. In saying all that, the atmosphere in Evanna's room is definitely more calm and she is even waking up for very brief moments at a time this morning. We're waiting for another ECHO to be done to check on her little heart, and they've been able to completely turn off the Milrinone and Epinephrine (these drugs help the the heart pump), which is a good sign. They're tweaking her sedation medication and ventilator settings to keep her as comfortable as possible, and are still continuing to do lots of blood work to monitor her kidney and liver function. Due to the fact that this is the second time she's experiencing acute liver failure, they want to do some further investigations and also have Plastic Surgery come look at that "hole" at the top of her." "Overall it's been a very quiet day. They ended up turning the Epinephrine and Milrinone back on this afternoon as her blood pressure became a little "soft", but again they're just so pleased with Evanna's progress, that they don't see it as a bad thing to need a little extra support considering yesterday's events. She's still not getting feed, so they are now giving her TPN, which is basically food given via intravenously to tide her over until it's safe to give her fold again. They also did another ECHO which showed dramatic improvements from yesterday and almost back to Mondays baseline. Finally, they are still pretty worried about her liver, as those numbers have continue to rise. I personally feel like Evanna is repeating March's episode, so I guess that's why I'm not too worried, but they are definitely thinking ahead in case her liver numbers don't improve soon. They were able to have a brief conversation with the "liver doctor" on the phone today, but she isn't able to come talk to us until 8am tomorrow, so that's where we stand." "Rounds was very long this morning. Not only was the regular medical team present, but so where 4 other doctors from other disciplines. Overall, Evanna is still continuing to do well. It looks like her liver numbers have finally peaked and starting to plateau, which means we are all breathing a little sigh of relief. They still want to run a few extra blood tests as immunology can be an issue for kids that have 22q11 (DiGeorge Syndrome). I guess they're just thinking that though her body acts appropriately to an infection, they're wondering if maybe Evanna's body slightly overreacts when she gets sick. Regardless, the gastroenterologist (the "liver doctor") is happy with how things are progressing and the pattern that her liver is following. We turned off the Milrinone again, but have left the Epinephrine on for a little longer, and they gave her a second dose of IVIG (basically antibodies) to finish out Wednesdays dose. We're still having a slight sedation/delirium issue (ie. Evanna waking up and freaking out causing her to drop her oxygen levels dramatically) -- but just like we did in Edmonton last time this happened, we're giving her a antipsychotic medication to help while she's on really high doses of sedation medication (we just think she's hallucinating and very delirious due to how much narcotics she's on). 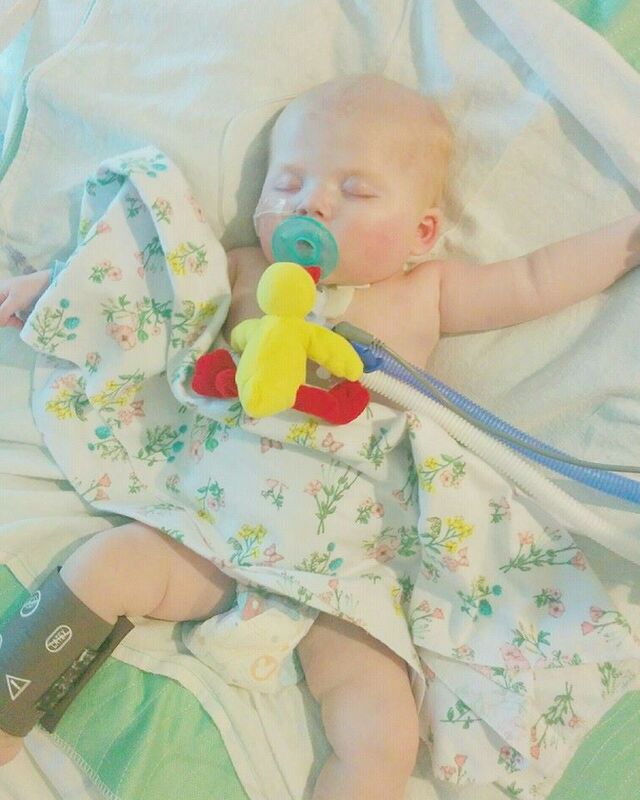 She's still on 5 different antibiotics, TPN (IV food), and keeping the Respiratory Therapists very busy, but she's still continuing to do better everyday." 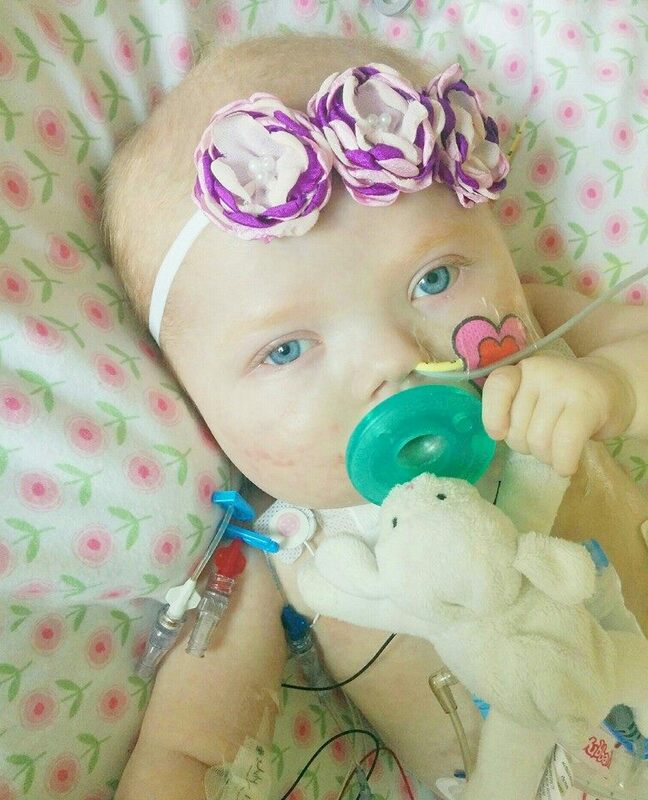 "Evanna had a rough night and required many PRN's (extra boluses of sedation medication). At the moment Evanna is very "fluid overloaded" -- as in swollen and puffy. That doesn't make it very easy to breath and also isn't very comfortable, so they have to keep her very sedated in order to keep her somewhat happy and in sync with the ventilator. They tried to diurese (make you pee) her a little bit last night, but that caused Evanna's blood pressure to drop, so they ended up having to give that fluid back to her. Today they're going to try a ventilator system called NAVA to see if that will help, but due to how sedated Evanna is, I have my doubts. NAVA is when they insert a NG tube through Evanna's nose that has a sensor probe attached to it. It sits by Evanna's diaphragm and detects when when she wants to take a breath and how big of a breath she wants and delivers that to her. We've used in the past, but Evanna needs to be more awake to actually "trigger" her own breaths, so we'll see how it works. Also, while I don't know the details, but apparently Evanna's enzymes are up again as well. Basically Evanna is still very sick and I'm just praying that Evanna's body stays strong enough to fight this dang sepsis." 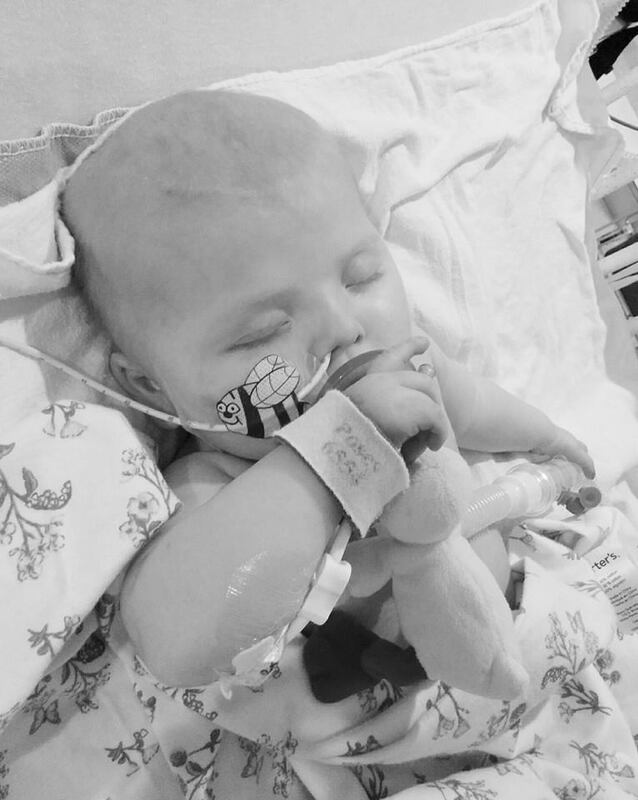 "PICU Day 273 || While Evanna is kind of fussy today (which she has every right to be! ), she is waking up and just requiring some "patting" to help sooth her. During rounds this morning the intentivist said that though Evanna is still having major "desaturation" moments, if you look at the trend over the last few days, they are happening less frequently, and she's not requiring major intervention (ie. drugs and bagging + suctioning) to get her oxygen saturations to come back up. All of her "heart drugs" (Epinephrine and Milrinone) are completely off, and they've already decreased one of her sedation medications. She's requiring a lot of oxygen at the moment (60-80%), but they've started her on a continuous lasik infusion (this helps you pee), in hopes that will help improve her oxygen requirements. While her liver enzymes numbers are still somewhat climbing, other numbers like her lactate, INR and surgars are normal, showing that her liver FUNCTION is indeed improving and she probably has a bit of hepatitis, meaning that her liver is just inflamed. They're giving her a very small amount of food to help trigger her gut, as well as turned off one of the antibiotics that isn't so nice on the liver, both of which they're hoping will help. If she handles the small amount of food that they're giving her today, they'll increase the volume tomorrow and hopefully turn off the TPN (IV food), which will also help her liver. The intentivist commented that while Evanna is taking tiny baby steps to getting better, it is PROGRESS! Sepsis shock is no joke, and it's still amazing at the fact that Evanna pulled through the way that she did. We just have to be patient and let her body heal." "Evanna had been very "wild" this morning, so I haven't had an opportunity to do an update until now. Unfortunately she didn't have a very good night and ended up being chemically paralyzed multiple times to help stabilise her. 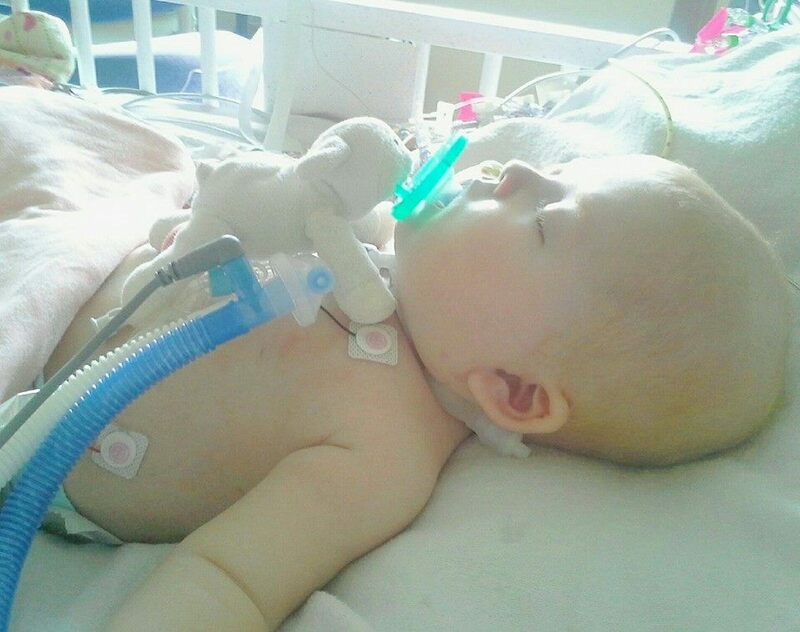 They had to restart her on Epinephrine again as her blood pressure was "soft", and that really effects her oxygenation. Her hemoglobin was also low, so Evanna is currently getting another blood transfusion which should definitely help. When Nick and I left last night, Evanna was on 80% oxygen (that's a lot!) on the ventilator, yet was still desating quite a bit. This morning she is down to 70% (still a lot), and is now at 60%, so hopefully we can continue to wean her oxygen back down to what her baseline is soon, which is 40% (room air is 21% fyi). This morning, Evanna has been super delirious and just incredibly unsettled. They decided to give her an extra dose of olanzepine (it's an antipsychotic) to help, and boy did that do wonders! She's just on so many drugs, and so she has been scoring very high on the delirium scale. However this afternoon she has been very calm, awake, and the content Evanna that I know. They restarted her on a lasik infusion to help with her puffiness and breath easier, and while I don't want to jinx myself, I feel like we're going to see a much better Evanna from here on out during this recovery. Finally it's Monday, which means there's a new medical team on, and being that Evanna is still pretty sick, I was reasked what our goals for Evanna is if she were to deteriorate again. It's definitely not a fun question to answer, but I understand why they have too, as normal "life saving" options are not exactly straight forward with Evanna due to her anatomy and not having a right superior vena cava (where they would cannulate through for ECMO). Hopefully Evanna just continues to move forward and back to her regular self, and we can avoid that situation all together." 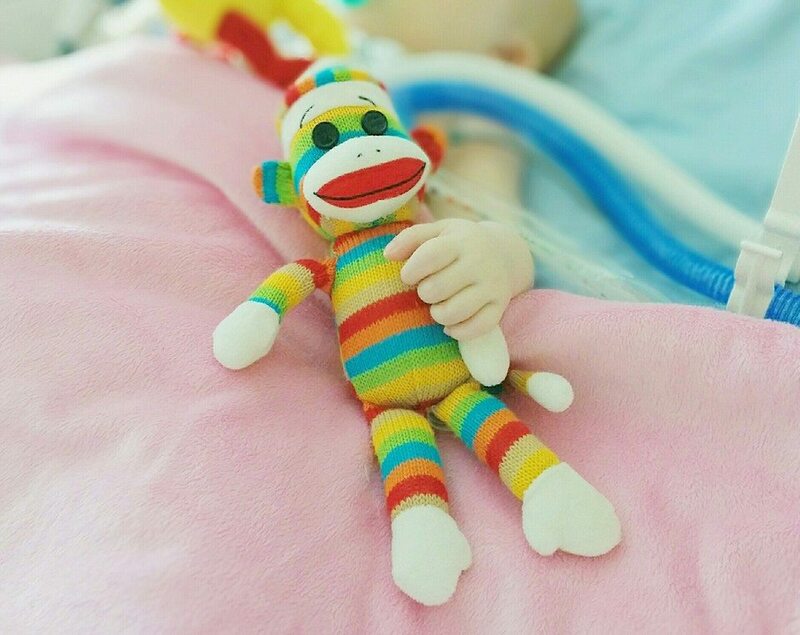 "PICU Day 275 || Though the Epinephrine is still on, it's been reduced, and her liver enzyme numbers are down (🙌). Nick said that Evanna is really sleepy today as they are transitioning her over from Hydromorphine to Methadone -- which they feel is an easier drug to wean. Due to the fact that we bounce back and forth between the Stollery and Alberta Children's over such a prolonged amount of time, we've really gotten to see some of the subtle "differences" between the two hospitals. In medicine there isn't always one "right" way to do things, and just depending on experience, training and opinions - intentivists like to do things somewhat differently from each other. There have been other things that we've noticed (trach care, the use of certain drugs, ventilator use, etc), and while it can make for a difficult transition, we're use to it now. At the end of the day they have Evanna's best interest at heart, and they always take our opinion and suggestions into account. 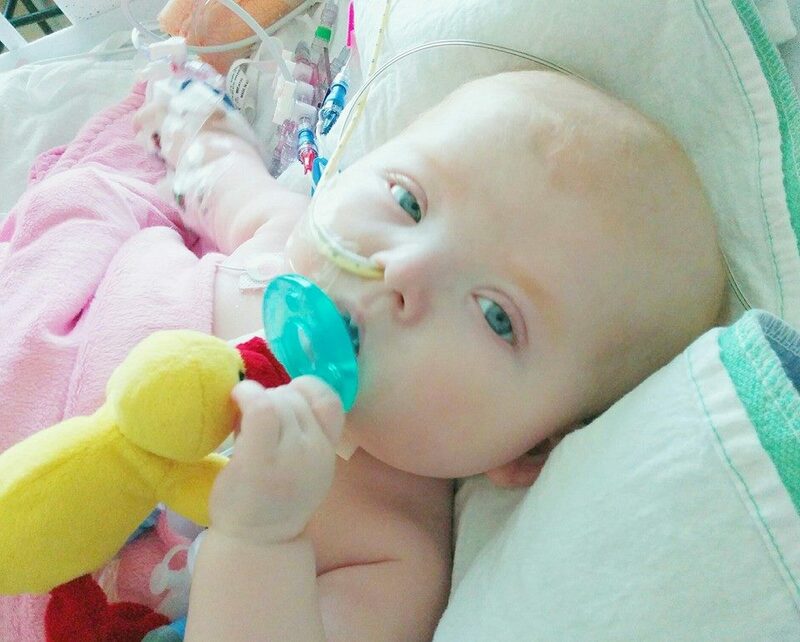 Finally, Evanna's oxygen requirements are down to 40%, which is her baseline, and so we're stoked about that. I'm in no rush to throw her back on her home vent and want Evanna to be more than ready before we make such an attempt." It was his first day back, but he thankfully was able to take a quick moment and visit us in the PICU -- she even gave him a small little smile! "PICU Day 277 || Concentrating on sitting up! Evanna actually lasted a LOT longer than I thought she would!! I just can't believe how far she's come in one week"
"FULL UPDATE: Wow, I can't believe the progress that Evanna has made over the past few days. We're still not back to her "baseline" of a few weeks ago, but we're getting pretty dang close! All of Evanna's IV sedation medication has been converted over to oral, and some have also already been reduced (though I may cry at how high some of her doses are again after we worked so hard to wean her -- oh well, it was necessary and I won't complain when you consider how things could have gone instead). She's not being feed by TPN anymore, and should be up to FULL feeds by later tonight! It's NJ mind you (so the food is basically going into her intestines past her stomach), but I'm sure we'll be back to NG in no time! We're holding steady on the hospital vent, and if she continues to do well, they'll transition her back to her home vent on Monday. Her liver numbers are looking fabulous, but we're still waiting to hear from immunology about some tests they ran last week on Evanna's immune system. The cardiologist feels that Evanna still has some fluid that she needs to get rid of - which I completely agree, so they've kept Evanna on a lasik infusion to help with that. They did another ECHO (ultrasound of the heart) now that she's off the Epinephrine again (hopefully for good this time), but while the results weren't terrible, they weren't great either. They're hoping that things will improve over the next few days and her heart just needs some more time to heal without the help of Epinephrine »» so this is where I need prayers concentrated on. I'm hopeful that over the next week we can get back to her home vent, NG feeds (and discussing oral feeding), take out the IJ line (she still has her trusty PICC line) and urinary cath, and ease her back into physical therapy. I also asked that when they feel it's appropriate, for them to stop using the ECG leads, as I don't want her to build up a sensitivity to these ones either (we're on our 3rd kind). Let's hope for a weekend of continued progress and coasting filled with lots of smiling!" "It was a day of decreasing her sedation medication (she's soo sleepy!) and continued diuresing. Evanna has gotten two baths over the past 24 hrs, fresh dressing changes on all her lines, and up to full feeds. We're down to two antibiotics which both have been assigned stop dates and overall they're still extremely happy with her progress." "We are not having a good day around here. Though Evanna had a great night and early morning, she accidentally pulled out her NG & NJ tubes (these go from her nose down into her stomach and past her stomach, which is how she is given food and administered oral drugs) and it's been downhill since then. 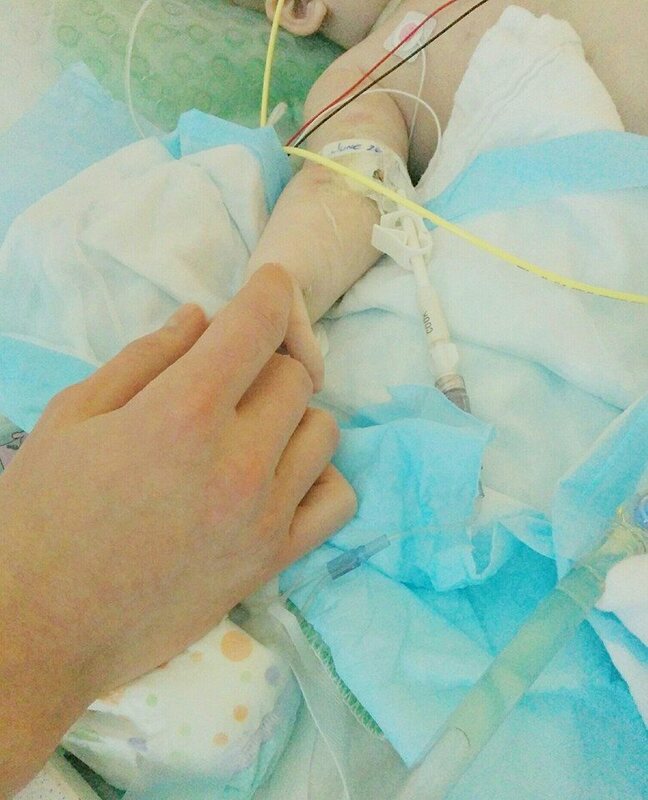 They have since been able to reinsert her NG (which is also her NAVA catheter for the ventilator), but that caused her to get extremely angry and difficult to settle. She is also incredibly puffy as she continues to have a positive fluid balance and overall looks like "crap". She has spiked a temperature, her heart rate is through the roof (190-210), and the RT's are having a somewhat hard time keeping her happy on the ventilator. There is some blood in her urine, but they *think* that might be from when she was thrashing around earlier. Yesterday we noticed she was developing a rash on her back, but we also *think* it's either a heat rash or her sensitive skin starting to react to the hospital linens. We just took another look look at it, and it definitely looks more "angry", so they're quickly running a CBC to check her platelet level. They JUST did a blood gas, and it doesn't look to bad (so I'm breathing a tad easier), and hopefully Evanna will improve over the course of the day. Earlier when Evanna wasn't doing so hot, she had wiggled herself side ways in her bed and we decided to just leave her like that while we attempted to insert an NJ back in. After multiple tries they gave up (we'll try again tomorrow), but after some more wiggling I began to notice something was off. Evanna was making a funny noise (she has a cuffed trach....so that's definitely isn't a good sign), and her colour was off. I suddenly realized that her trach was halfway out and so I yelled for the nurse to pull her vent tubing closer. I then yanked all of Evanna's bed rolls off the bed and flipped her back around on the bed so her trach would have more slack. Doctors and RT's came running into her room, but by then, she had already recovered." 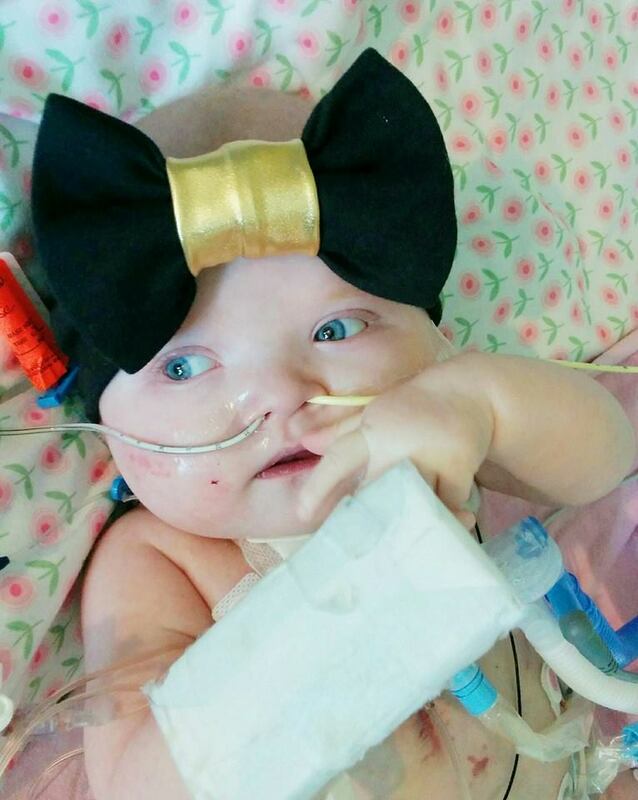 "PICU Day 280 || We came into a much happier and content Evanna this morning. Not too many changes are being made, as they don't want to rock the boat, but they will soon try to reinsert her NJ so we can restart her feeds. She's currently enjoying being read to by Nick -- which is definitely one of her favourite things to do." "Today we continued to drop her sedation medication (specifically her Ativan), and continued to try and tweak her diuretics. This was my biggest issue and frustration over the weekend, but I feel both the cardiologist and intentivist on this week listened to me this morning and are not afraid to be a tad more aggressive in getting some fluid moved off of Evanna (it really effects her breathing). I talked to the cardiologist later this afternoon, and once we get Evanna back to her "baseline" in regards to her fluid balance, she definitely agreed that we should revert back to what we were on up in Edmonton, as I feel we had really found Evanna's sweet spot. Evanna should complete her antibiotic course by Wednesday, which means we can finally take out her IJ/central line. While it was the line that we needed when she got really sick and saved her life, the longer it's in, the more at risk for infection it becomes. It's also in her neck, which is a terrible spot for so many reasons (chubby baby has "no neck", sweaty, trach ties/trach care, difficult dressing changes), and so I'll be so happy when we can finally take it out. We're almost back to her normal ventilator settings on the hospital vent and the plan is to switch her back over to the home vent sometime later this week. I've also asked Dr. Blackwood (the intentivist) about going back to NG feeding, and while she said it's not a guarantee this week, it's a possibility that she'll keep it in the back of her mind (which is all I can ask for). Speaking of feeding, with all the tube issues we had over the weekend (Evanna accidentally pulling them out and having a hard time getting them placed back in), they've finally restarted her on feeds this morning and we're already back to full feeds! Evanna also had an ECHO (ultrasound of the heart) this morning, and while it's still not back to where we would like to see it, she is still showing improvement. The rash on her back is remarkably better and they took out her urinary catheter as well. I'm sure I'm forgetting something that happened today (she had an ultrasound of her jugular veins to check for clots and another xray of her tummy), but that's all I can think of at the moment." "It's been a good few days of slow but steady progress. Yesterday they switched her continuous lasik infusion (a diuretic medication) to boluses, and hopefully we can switch back to oral in the near future. Last night Evanna received the last of her 14 day course of antibiotics, with the plan to take out her IJ/central line tomorrow (yeah!!). While Nick and I have each done trach changes with the assistance of an RT, yesterday we did one completely by ourselves (but with like 5 people watching mind you). They said we did an excellent job and have amazing communication skills, but it helped that Evanna was such a good little girl. Last night Evanna pulled out her NJ feeding tube again by accident, but they decided to just feed her by NG to make things easier (this means food is now going into her stomach!). She's on continuous feeds, but I'm sure we can start compressing/bolus feeding her soon if she behaves herself. Today they decided to cut her olanzepine (it's an antipsychotic medication) in half, as now that we're going down on her sedation medication, she doesn't need it anymore. While it was our idea to put her on it to help deal with the awful delirium she was experiencing, the downside is it hinders her "personality" (she's there, but no one is really home). So hopefully she's off of it in the next few days, and we can see our happy and smiley Evanna again! We've also been starting to sit Evanna up here and there, and we put her in the tumbleform chair for the first time in weeks this morning (yeah for physical therapy!) Finally, if Evanna has a good night, we may put her back on the home vent tomorrow!! While we've come a long way since July 1st, and we still have a little ways to go, I'm hoping that we keep take steps forward and out of the ICU." Wow - that was one LONG blog update! I just finally wanted to catch up and get the order of events up on the blog so we can move forward. I seriously can't thank everyone enough for everything that has been done for us. Thousands of prayers have been said for our little family over the last few weeks, meals/lunches have been dropped off to our house so we don't have to worry about making food, cute little care packages have made their way to our ICU room, and we're overwhelmed with all the love that we have received. I'm beginning to believe that Evanna is here for a bigger reason then I can't comprehend, and she is meant to inspire people. Despite our amazing medical team and the advancements available to us, there are just some things that are unexplainable, the Lord's hand is at work and prayers were heard.